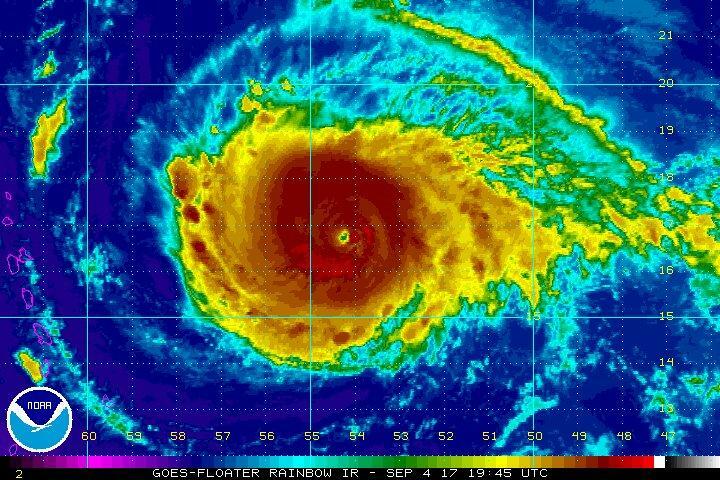 Update: Hurricane Irma was upgraded to a Category 5 storm on Tuesday morning. SAN JUAN, Puerto Rico -- Hurricane Irma became a Category 4 storm Monday, according to the National Hurricane Center, which said "preparations within the warning area should be rushed to completion." Irma is expected to move near or over portions of the northern Leeward Islands as a "dangerous major hurricane," accompanied by life-threatening wind as well as storm surge and rainfall, according to the NHC 11 p.m. ET advisory. The NHC said in its latest advisory that Hurricane Irma's maximum sustained winds remain at 140 mph and is moving west at 13 mph. NHC issued a hurricane warning for Puerto Rico and the U.S. and British Virgin Islands. It said that it's still too early to determine what direct impact Hurricane Irma might have on the continental United States. In Florida, state Gov. Rick Scott declared a state of emergency. He urged "all Floridians to remain vigilant and stay alert to local weather and news," as well as visit FLGetAPlan.com to prepare. He declared the state of emergency for all Florida counties. "In Florida, we always prepare for the worst and hope for the best and while the exact path of Irma is not absolutely known at this time, we cannot afford to not be prepared," Scott said, CBS Miami reported. Elsewhere, workers in the northeast Caribbean were clearing drains and pruning trees as authorities urged islanders to prepare for the storm. The possibility that the storm could eventually turn its wrath on the U.S. East Coast has officials of the American Red Cross concerned. They told CBS Raleigh, North Carolina, affiliate WNCN-TV the need for assistance in Texas in the aftermath of Hurricane Harvey is still high, but the Red Cross' focus and resources might shift toward North Carolina, based on what Irma does. "We put a hold on sending volunteers from the Mid-Atlantic states," Red Cross Regional Executive Officer Barry Porter told WNCN-TV. "There is still a lot of other states to send volunteers from, but because of this pending threat to Florida, Georgia, South and North Carolina, we've asked those volunteers to hold, update their records, and help us here in the Carolinas if we need them." U.S. residents were urged to monitor the storm's progress in case it turns northward toward Florida, Georgia or the Carolinas. "This hurricane has the potential to be a major event for the East Coast. It also has the potential to significantly strain FEMA and other governmental resources occurring so quickly on the heels of Harvey," Evan Myers, chief operating officer of AccuWeather, said in a statement. American Airlines announced flight cancellations Monday evening. The company added two flights that will depart prior to the storm's arrival, saying "customers can contact our reservations team to be rebooked." In a statement, the company said, "Our Integrated Operations Center (IOC) in Fort Worth, Texas, continues to closely monitor the track of storm, and we expect to make additional changes to our schedule as the storm continues to track on a west-southwestward course." Meanwhile, a hurricane warning was issued for Antigua and Barbuda, Anguilla, Montserrat, St. Kitts and Nevis, St. Martin, Saba, St. Eustatius, St. Maarten and St. Barts. In the Caribbean, Antigua and Anguilla shuttered schools on Monday, and government office closures were expected to follow. On the tiny island of Barbuda, hotel manager Andrea Christian closed down the Palm Tree Guest House as Irma approached. She said she was not afraid even though it would be her first time facing a storm of that magnitude. Both Puerto Rico and the U.S. Virgin Islands expect to receive 4 inches to 8 inches of rain and winds of 40-50 mph with gusts of up to 60 mph. Puerto Rico Gov. Ricardo Rossello warned of flooding and power outages. "It's no secret that the infrastructure of the Puerto Rico Power Authority is deteriorated," Rossello said. He activated the National Guard, canceled classes for Tuesday and declared a half-day of work. Meteorologist Roberto Garcia warned that Puerto Rico could experience hurricane-like conditions in the next 48 hours. The U.S. Virgin Islands said schools would reopen on Friday instead of Tuesday. In the Dominican Republic, Public Works Minister Gonzalo Castillo said workers there were also clearing away roadworks and cleaning out sewer drains and that President Danilo Medina would meet with emergency agencies.